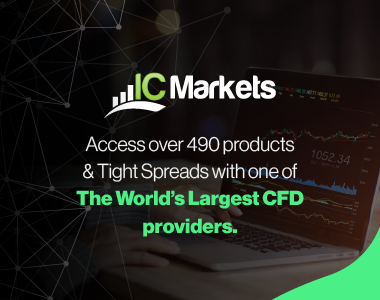 Following the week’s open, the single currency saw a conservative stream of bids enter the market place yesterday, lifting prices up to the 1.12 band going into the US trading session. Considering only the H4 timeframe at the moment, the EUR could potentially pop above 1.12 today and connect with the H4 resistance level at 1.1237 (merges with a H4 61.8% Fib resistance at 1.1228). Should this play out, we’d also have a H4 AB=CD completion pattern take shape just above the aforementioned H4 resistance around the 1.1242ish range (see green arrows), thus increasing the chance of a reaction being seen from here. With the above in mind, how do things stand on the higher timeframes? Up on the weekly chart, the candles show price continues to loiter just ahead of a major weekly resistance area coming in at 1.1533-1.1278. Meanwhile, daily action remains trading within the upper region of a daily resistance area seen at 1.1224-1.1104. Our suggestions: In view of the confluence seen around the current H4 resistance level, a bounce from here is likely. However, in order for this to play out, price would need to whipsaw through the top edge of the daily resistance area. But, with this there’s always a chance that breakout buyers could take prices up to either the underside of the weekly resistance area, or to the daily supply seen at 1.1446-1.1369. To overcome this, we’d simply recommend waiting for lower timeframe confirmation to form prior to pulling the trigger (see the top of this report). Granted, this is by no means a guaranteed safety switch, but it does increase your chances of avoiding a loss or a fakeout. Sells: 1.1237 region [Tentative – confirmation required] (Stop loss: dependent on where one confirms this area). In recent trading, the GBP continued to sag against the USD. Before price dropped to fresh lows, however, the pair tapped into a pocket of bids around the 1.29 band which managed to reach highs of 1.2945. 1.29 was, as you can see, eventually taken out and price found support just ahead of a H4 Quasimodo support coming in at 1.2864. Directly below 1.29 sits a H4 Quasimodo support at 1.2864, which merges beautifully with a H4 AB=CD approach (see black arrows). The above levels are all related to a larger H4 harmonic Gartley reversal zone fixed between 1.2864/1.2935 (green zone). We also went on to suggest that since the H4 harmonic bullish pattern has formed within a bearish downtrend (seen clearly on the weekly timeframe) we’d highly recommend waiting for lower timeframe confirmation (see the top of this report) to form before placing capital on the line. As of yet we have been unable to pin down a lower timeframe entry from this region. Another route one could potentially take here is simply to use the H4 timeframe for entry. For the bulls to demonstrate muscle here, a decisive close above 1.29 would need to take place. Should this come to fruition, a long trade could be taken if price retests this number as support and holds firm, targeting the key figure 1.30, followed by a H4 resistance area at 1.3064-1.3109 (encapsulates the daily resistance level at 1.3104 – the next upside target from the current daily demand base). Buys: Watch for price to close above the 1.29 handle and look to trade any retest seen thereafter. Kicking off with a look at the weekly chart this morning, we can see that weekly price recently came within striking distance of reconnecting with the weekly trendline resistance extended from the high 0.8895. This – coupled with the daily chart currently occupying a daily supply zone drawn from 0.7719-0.7665 may encourage sellers to bring the Aussie back down to weekly support penciled in at 0.7604. Stepping across to H4 chart, the commodity-linked currency was bid from a H4 channel support line taken from the low 0.7420 yesterday, which, as is shown on the chart, managed to reach highs of 0.7691 during US trading. Could Monday’s advance simply be a round of short covering from Friday’s sell off? We only say this because of where price is located on the higher-timeframe picture. Our suggestions: Our team has absolutely no interest whatsoever in buying this pair at the moment due to the higher timeframes. With that being the case, we’re now watching for a break below both 0.7650/H4 channel support. A decisive push south would likely open the doors for price to challenge the 0.76 handle – essentially the weekly support we discussed above. To trade this possible intraday move, watch for price to retest the 0.7650 area following a close lower. Despite this trade being supported by higher-timeframe flows, we’d still recommend waiting for lower timeframe confirmation before pulling the trigger (see the top of this report), since fakeouts around psychological boundaries are common view. During the course of yesterday’s sessions the market took on more of a sober tone, ranging sixty pips around the 101 handle. While 101 continues to hold ground, we believe that this number will be engulfed as we move into the more liquid sessions today. Our reasoning lies within the higher-timeframe structures. Both the weekly and daily charts show room to move south down to weekly support fixed at 100.61. With that in mind, 100.61 will likely act as a magnet for price, consequently pulling the market below the 101 band. In addition to the above, the 100.00/100.61 region (green box) is a very interesting zone for longs. Apart from the weekly support and key figure 100, there’s also a H4 Quasimodo support seen at 100.19 and a H4 AB=CD approach taken from the high 102.65. Our suggestions: A long trade from the above said H4 green zone is a high-probability reversal area in our book. Therefore, our team has set an alert at the 100.60 mark. Once/if this triggers, our team will begin hunting for lower timeframe buy entries into the market from here (see the top of this report for lower timeframe entry techniques), targeting the 101 handle as a first take-profit target. Why we still require lower timeframe confirmation from such a confluent barrier is simply due to the direction of the overall trend on this pair right now. In view of the weekly chart showing price recently selling off from supply at 1.3295-1.3017, this could encourage further selling in this market this week and possibly bring the pair down to a weekly trendline support extended from the high 1.1278 (intersects beautifully with a weekly Fib support line at 1.2649). Looking down to the daily chart, price closed below a daily trendline support extended from the low 1.2831 yesterday, and has in all likelihood opened the doors for a continuation move down to another daily trendline support taken from the low 1.2460. In addition to the above notes, oil prices rallied yesterday thus placing further pressure on the pair. The day ended with price defending the 1.29 handle which remains bullish as we write. Now, considering that there is a collection of stacked H4 supply seen over on the oil market between 45.77/46.90, and the H4 Quasimodo support at 1.2876 (on the USD/CAD) intersects beautifully with the daily trendline mentioned above (1.2460), a bounce from within 1.2876/1.29 is highly possible today (green zone), despite weekly action reflecting more of a bearish stance. Furthermore, H4 price is also currently tangled within a H4 harmonic Gartley reversal zone between 1.2945 (H4 78.6% Fib support) and the X point of the pattern at 1.2861. Our suggestions: Watch for a lower timeframe buy entry between 1.2876/1.29 today (see the top of this report). While this is quite a notable area from a technical perspective, do remember where the weekly price is coming from! We ONLY expect a bounce and will trade this accordingly. 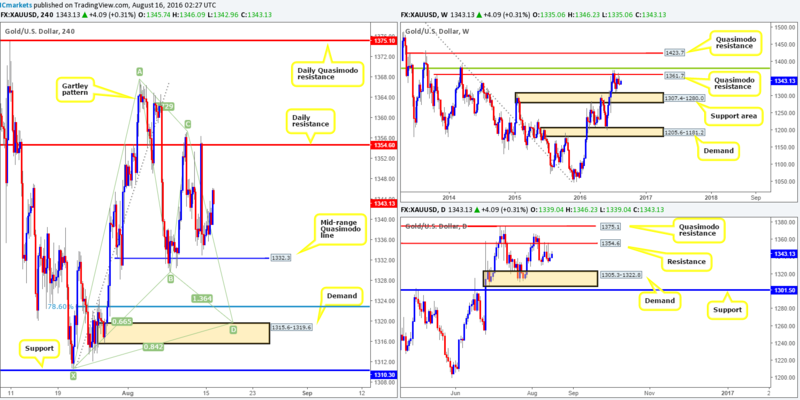 Buys: 1.2876/1.29 region [Tentative – confirmation required] (Stop loss: dependent on where one confirms this area). In the last few sessions, the USD/CHF pair entered into a phase of consolidation fixed between a H4 resistance area at 0.9765-0.9750 and a H4 support line drawn from 0.9710 (coupled with a H4 61.8% Fib support at 0.9714). Technically speaking, we feel the pair will likely break north of this range. The ingredients behind our current line of thought quite simply stem from daily price hovering above a daily support area at 0.9648-0.9708. Moreover, there’s little direction currently being drawn from the weekly chart given that price is trading mid-range between weekly supply coming in at 1.0092-0.9928 and a weekly support level at 0.9508 (merges with a weekly trendline support extended from the low 0.8703). Our suggestions: Watch for price to break above and retest the current H4 resistance area. Should this come into play, we’d advise looking for lower timeframe entries into the market from this zone (see the top of this report), targeting the 0.98 handle. Now, the other key thing to note here is that price could potentially halt ahead of the 0.98 figure since there is a daily resistance area lurking just above at 0.9819-0.9784, so remain vigilant! Buys: Watch for price to close above the H4 resistance area at 0.9765-0.9750 and look to trade any retest seen thereafter (lower timeframe confirmation required). The H4 support area seen at 18570-18532. The market is likely to find some support here on its second time back with it having been a relatively distinct resistance point before. Nevertheless, waiting for the lower timeframes to prove buying interest resides here is (see the top of this report), in our opinion, the safer route to take, since price could still head down to the H4 broken Quasimodo line at 18482. The H4 broken Quasimodo line at 18482 is also a barrier we’re interested in, due to it fusing nicely with a minor daily support level penciled in at 18480. Given how well this line held previously (10/08/16), and more importantly, its connection to the daily timeframe, one may want to consider entering on the touch here rather than waiting for lower timeframe confirmation. Following the week’s open, the gold market remained relatively well-bid throughout the trading day. This, as far as we can see, was likely due to a soft response from H4 support at 95.48 over on the US dollar index. In the event that this barrier gives way, the next area to keep an eye on comes in at 95.18, which could propel the yellow metal back up to the daily resistance level coming in at 1354.6. Should this come into view, a short from the aforementioned daily resistance line is certainly valid, if one also takes into consideration the nearby weekly Quasimodo resistance at 1361.7. Together, they form a relatively tight base for shorting opportunities! On the flip side, assuming the US dollar bulls get their act together and pump the dollar higher, we’ll likely see the metal cruise lower. As we mentioned in our previous report, we have no interest in buying from the H4 mid-range Quasimodo line at 1332.3 due to how close price is to the above said higher-timeframe resistances. Therefore, if gold declines in value, we’re going to be watching for a close below the above said H4 broken Quasimodo line, for a retest trade, targeting H4 demand at 1315.6-1319.6. We would recommend waiting for lower timeframe confirmation to form (see the top of this report) prior to pulling the trigger simply to avoid any fakeout seen on the retest. Should price reach this H4 demand base, all of our short positions are to be liquidated and we’ll then go about looking to possibly enter long at market (dependent on the approach and time of day) from this area. However, do be prepared for price to drive below this zone before buyers step in! The reason as to why is because along with the H4 demand and it’s supporting higher-timeframe demands (weekly support area at 1307.4-1280.0/daily demand at 1305.3-1322.8), we also have a merging H4 harmonic Gartley reversal zone between the H4 Fib 78.6% support at 1322.7 and the X point of the harmonic pattern at 1310.7.